Raw Azeztulite gemstone specimen that measures 12 mm tall x 46 mm wide x 31 mm deep and weighs 19.53 grammes. Sourced from a reputable supplier and supplied with a certificate of authenticity card. You will receive the pictured specimen. Chakra's - All including the Etheric Chakra's 8th to 14th. Physical - Initates Cellular Regeneration, infusion of the body with spiritual light. Emotional - Supports awakening to Universal Love, clearing the emotional body. Spiritual - Inspires union with Divine Light, mutual awakening with the Earth. White Azeztulite is the original type of Azeztulite found in North Carolina and Vermont. It is opaque white or transparent Quartz with an hardness of 7. It is distinguished from other Quartz primarily by its powerful high vibration currents. 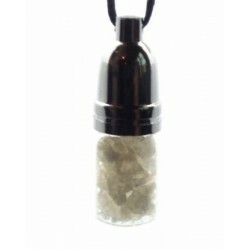 White Azeztulite from Vermont and North Carolina carries one of the highest Spiritual frequencies of any stone. Its currents of the nameless light from the Great Central Sun flow throughout the body, realigning the entire liquid crystal body matrix, encouraging cellular regeneration and healing. These stones stimulate all of the potentials of the spiritual human being, the awakened beings we are destined to become. Through our connection with the currents of Azeztulite, we can channel Divine Light into the Earth for her healing and awakening. Meditation with White Azeztulite brings light into one's consciousness, often beginning as scintillating sparks, evolving into the immersion of one's awareness as well in the Clear Light of the Divine. White Azeztulite quickens cellular consciousness as well, aiding in the development of the Mind of the Cells, a new center of awareness destined to work in co-creative partnership with us. It is a stone of Light Body awakening, of resurrection and Ascension. It is the key stone of the New Consciousness and can elevate the energies of all other stones. This information was obtained from the Heaven and Earth Website so the Copyright belongs to them.